You see this sign offering ice cream cones for only a quarter and it sounds like a pretty flippin’ awesome deal. 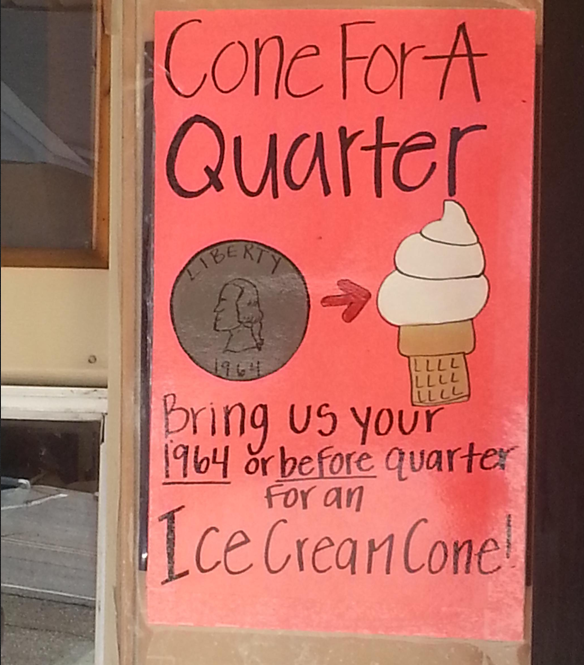 But then you notice that the store is only looking for quarters from 1964 or earlier, and if you have one of those lying around, you might want to consider just how much you value ice cream. See, between 1932 and 1964, quarters contained 90% silver, which means each quarter contains 0.1808 troy ounces of silver. Now, the price of silver fluctuates, but Coinflation.com calculates that at $23.75 per troy ounce, the silver in these hard-to-find coins is worth around $4.29. Depending on the size of the cone and your local ice cream shops’ prices for cones, that may not be a bad deal. However, that old coin could be worth a lot more depending on the condition and rarity. Many of these quarters go for a minimum of $5.75 to collectors, with some going significantly higher, with the rarest, uncirculated quarters going for several hundred dollars. Even if you have a completely average silver quarter, it’s probably best to hold on to it and just go out of pocket for that ice cream cone.